Puss in Boots was always one of my favourite childhood stories. It had a smart cat. In boots. I found this 1911 version illustrated by Gordon Robinson in a used book store a few years back. After the online presentation you’ll have the option to download a PDF scan of the original. Soon after, the old miller died, and each of his sons took what he had left for him. The young man was so surprised at what the cat said and so impressed by his earnest manner, that he went to the shoemaker at once and ordered a very pretty pair of little boots; he also bought – with his last money – a nice little hunting bag and presented these to his cat. The miller’s son buys Puss a pair of boots and a bag. Puss was much pleased with the new boots, which fitted him perfectly, and he was very proud indeed when he slung the bag over his shoulder and set out. He asked his master to wait until he came back. With a quick, light step, Puss marched along the road to the wood where there was plenty of game. At the foot of a big tree he placed his bag, first putting some carrots into it; hiding behind a tree, he held the cords of the bag. Then he crouched down and kept very still. 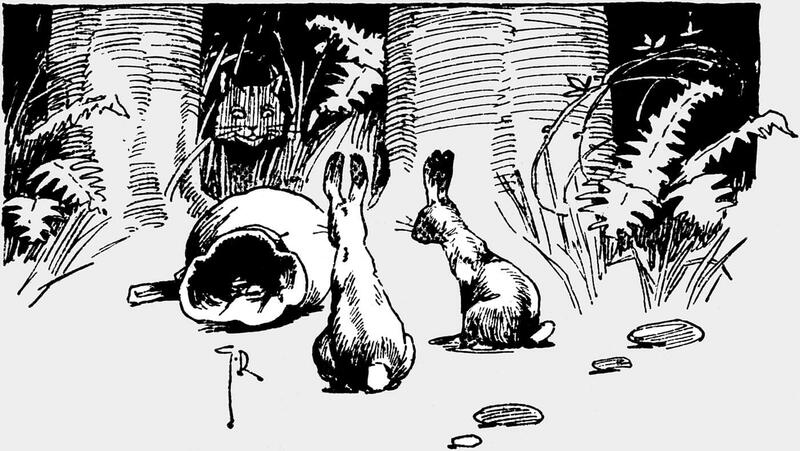 Soon he saw two fat little rabbits come out of their burrow and jump around the bag; they smelled the carrots, and being very hungry bunnies, rushed into the bag to eat them. The clever Puss quickly pulled the string and the two rabbits were caught! He knew that the King was very fond of roast rabbit, so he started out for the palace, and stepping into the royal kitchen, he presented the fat bunnies to the King’s cook, saying that his master – the Marquis of Carabas – had sent them to the King. Puss visits the King’s cook. The cook thanked Puss in the King’s name, and with great care he prepared the rabbits for his Royal Master’s dinner. When the King was served with the fine dish, he was so pleased that he asked the cook at once where he got the rabbits. “They were sent to your Majesty by the Marquis of Carabas,” said the cook. Next morning Puss, without telling the miller’s son where he was going, started out for the cornfields, and there he again spread his bag and put some ripe wheat into it. He then hid behind a sheaf of corn, taking care to hold the strings; he had only a short time to wait. A fine pair of sleek pheasants hopped out onto the field, and seeing the wheat in the bag, were caught just as the bunnies were. Again Puss went to the palace, knowing if there were anything the King liked better than roast rabbit, it was pheasant pie. The royal cook was very pleased to accept the cat’s present, which was sent to the King by the Marquis of Carabas, as Puss again said. The King enjoyed the pheasant pie very much indeed and asked the cook where he got such tender birds. The cook told him the Marquis of Carabas had sent them. The King thought the Marquis was most kind to remember him as he did. Now Puss began to think it was time for his master to meet the King, but as the poor miller’s son had no beautiful silk and velvet clothes, he could not visit the King at the palace. Puss, however, had an idea. The King was to drive along the road that afternoon in his fine carriage. Puss told the miller’s son to go to the mill pond, undress there and jump into the water, The miller’s son did this and Puss picked up the clothes his master took off and sunk them in the pond. The King’s coach passing the pond. “The Marquis of Carabas?” said the King; “he has been very kind to me in the past few days, and I am glad to do him a favor in return.” He ordered one of his footmen to bring the miller’s son new clothes of velvet and silk, trimmed with gold lace. When he came out of the water and dressed in his new clothes, he looked like a real prince; in fact, his appearance was so fine that the Princess fell in love with him on the spot. The King invited the young man to take a seat in the carriage, and with Puss running on ahead, they drove along the road. Puss in the giant’s castle. While the King was stopping along the road to talk to the farmers, and wondering how rich was the Marquis of Carabas, Puss arrived at a huge castle in the midst of fine fields. This castle and all the land for miles around belonged to a very wicked giant. When the giant saw Puss he thought he would make a good meal of him; but Puss flattered him so much about his wonderful powers, that when Puss asked him if he could change himself into a lion, he was glad to show how quickly he could do this. In a flash, instead of the big giant, there stood a roaring lion. Puss was very much afraid at first, and asked the giant to change into a mouse. As he did this Puss jumped on him and swallowed him, before he could change himself back to the giant. Puss then took possession of the castle, in the name of the Marquis of Carabas, and by that time the royal coach and party drove up. When the King was told by the cat that the castle and all the land belonged to the Marquis of Carabas, he was very much impressed, and gladly agreed to the wedding of his daughter with the miller’s son, who was now the Marquis. They were married at once and lived very happily in the castle forever after. Puss had a fine home with his master and was the pet of the household.